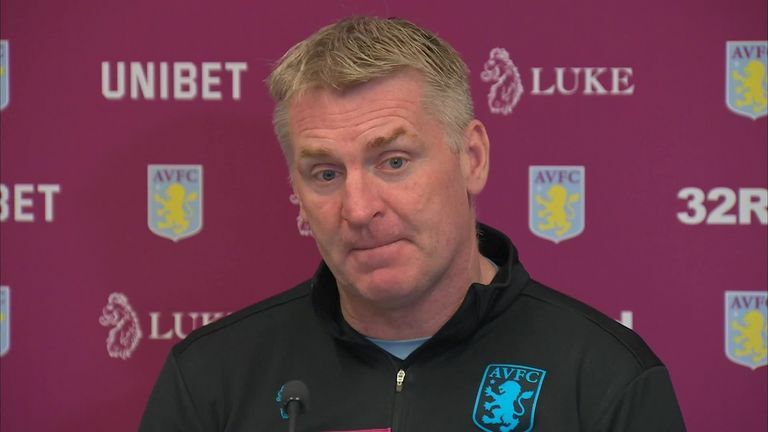 Aston Villa boss Dean Smith says the forthcoming run of fixtures could be pivotal to his side's Sky Bet Championship play-off hopes. Villa, ninth in the table and four points shy of a top-six spot, host title-chasing Sheffield United on Friday - live on Sky Sports Football - before a trip to Brentford and a home derby with promotion hopefuls West Brom next week. "It's a test but that is what these games in the Championship are all about, you want to be tested," Smith told the club's official website. "We've got a three-game week coming up beginning with Sheffield United and then my old club Brentford and then a local derby against the Baggies on the Saturday. Smith is under no illusions about the difficulty of the task on Friday, but he believes there will also be pressure on the Blades, who would go top of the table with victory at Villa Park. "I'm excited about the games coming up but we look no further than Sheffield United," said Smith. "It will be a tough game, they're a good team with some really good players. Billy Sharp may be in the latter stages of his career but he is head to head with Tammy (Abraham) in the goalscoring charts. "They are a team who know what they are doing and they are organised. But they need a win as well to get back in the top two and we need a win to stay in touch with the play-offs, so it should be a good game."